I love collecting recipes and have been doing so for many years since I was a child. I still have recipes from school and preserved them more for sentimental reasons than any urge to cook things like Stewed Apples with a Crumble made from Shredded Wheat or School Winter Salad which meant chopping raw swedes and beetroots and combining them in salad cream. I hated both those recipes and perhaps those cookery lessons were the reason why I wasn’t an enthusiastic cook. As time progressed I kept recipes that were mostly for cakes or biscuits and it’s clear there was a theme developing by the time I reached my teenage years. As a very young child in the 1960s I loved the days when mum would get her Be-ro book down from the shelf and decide which cakes to bake. It was my favourite book because nearly every recipe was accompanied by a small sketch of what you’d be baking. Best of all, there was a colour picture on the front cover of this narrow-paged book of a lady in her apron making a cake and holding up her Be-ro recipe book like a trophy she’d just proudly won. I’ve got a few of the old Be-ro books now and still use some of their recipes at home. Packets of baking ingredients are also a good source for recipes and my old recipe box is full of ‘backs-of-packs’. Some of the brands are long lost or just a distant memory now but their recipes live on. I have the best cherry cake recipe with unsinkable cherries from an old packet of ground almonds and tea loaf recipes from dried-fruit packs that are still very good. 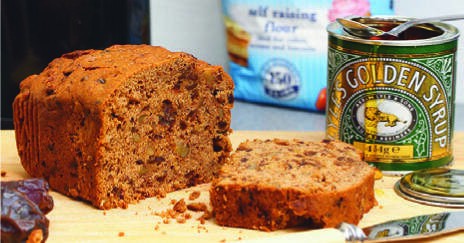 A particular favourite is a date and walnut loaf recipe that was printed on a pack of dates in nineteen-seventy-something! The recipe is easy to make and full of taste. You can add more walnuts if you wish or substitute the golden syrup for black treacle. The loaf can be wrapped in foil and if kept cool will keep for at least a week. Serve sliced, with or without butter and a good cuppa. Set your oven at 180C/Gas 4/350F and line a 2lb/1kilo loaf tin. Put dates into a heat-proof bowl, add the bicarbonate of soda and pour over the hot tea. Stir and leave to stand for a few minutes whilst you mix the rest of the cake. Beat the Stork and sugar together on a high speed in a mixer until well blended. When the mixture is very soft, beat in the egg and syrup/treacle. Put the remaining flour onto the creamed mixture and top with the walnuts, dates, and tea. Mix all these ingredients together on a slow speed until well combined. Spoon into the loaf tin and level off the top with the back of the spoon. Bake for 1 – 1 ¼ hours until a skewer comes out clean. Let the loaf cool for ten minutes before turning out onto a wire rack to cool. For a softer loaf, cover loosely with a clean tea towel whilst cooling.